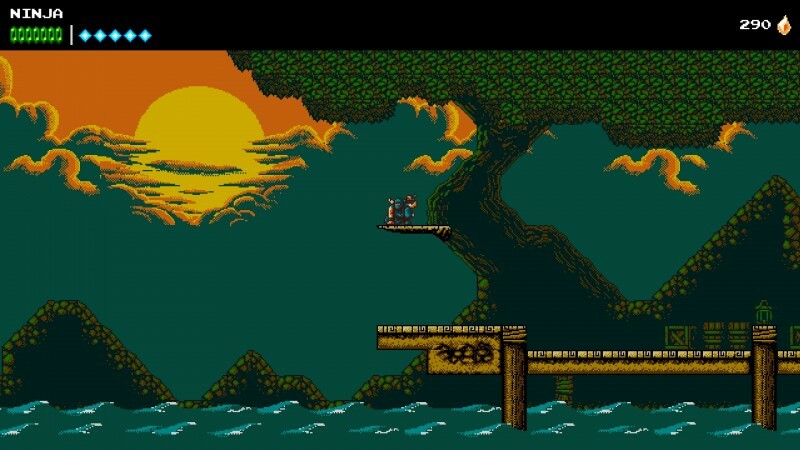 Retro throwbacks are a dime a dozen these days, with independent developers paying loving homage to the games they grew up with. 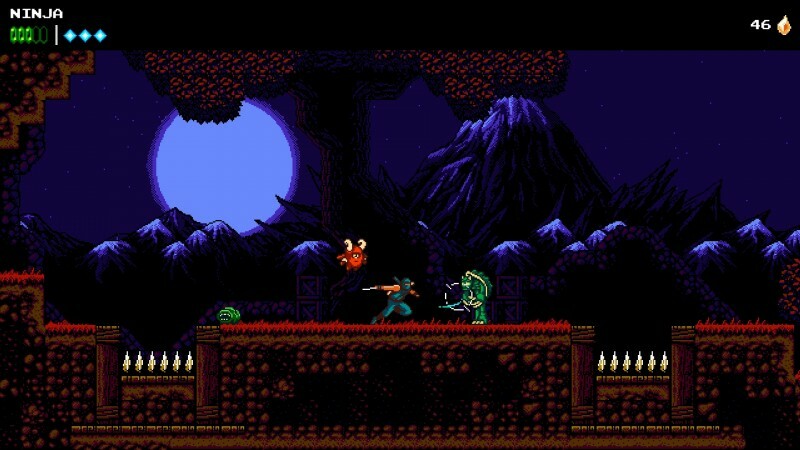 The Ninja Gaiden-inspired action platformer The Messenger accomplishes this feat while simultaneously subverting the genre in multiple ways. 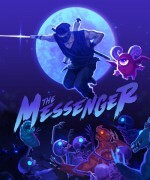 The Messenger puts you in the tabi of a young ninja chosen to fulfill a prophecy and combat a curse overtaking the land. The 2D adventure tasks you with traveling through myriad diverse regions on your way to the frozen peak. 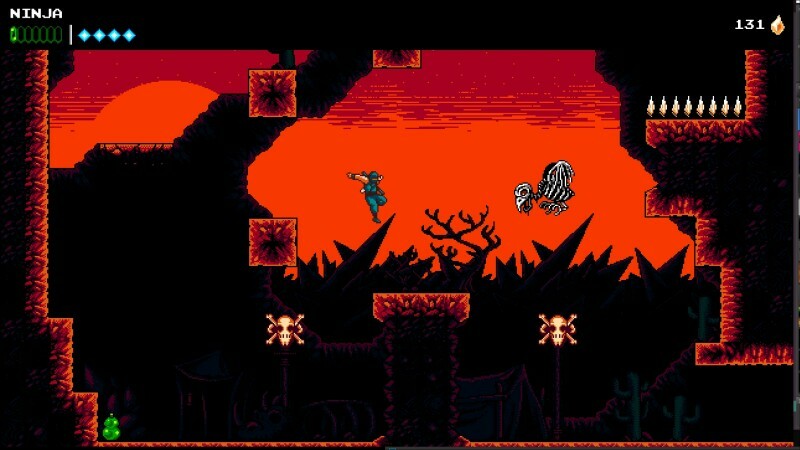 During your travels, you must conquer death-defying platforming sequences that require precision controls. Whether you’re jumping from ledge to preciously placed ledge or unsheathing your sword into the face of an enemy, The Messenger’s controls are as tight and responsive as they come. 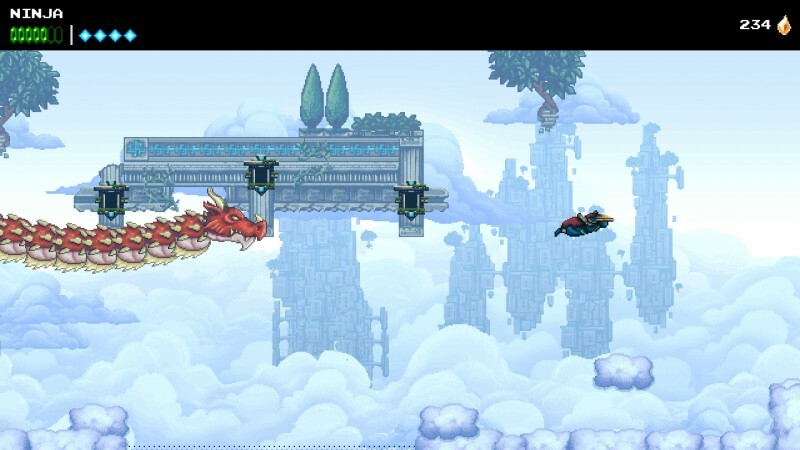 You start with a basic moveset of jump and attack, with the ability to cloudstep, an extra mid-air jump granted each time you perform a successful attack. 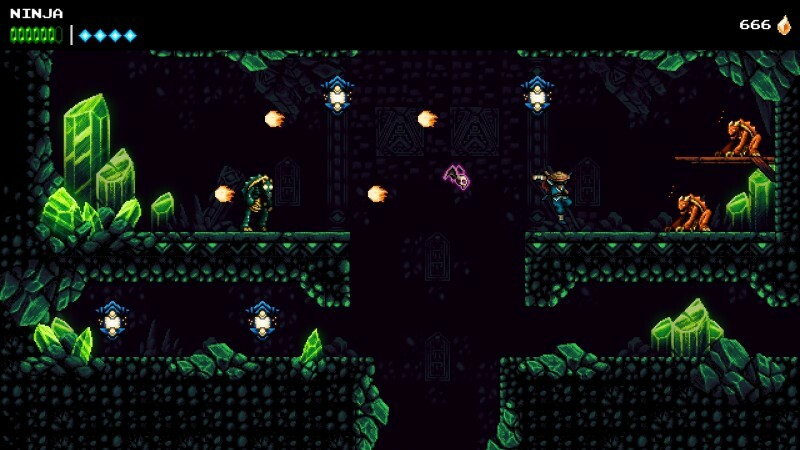 That small restriction on double jumps sets you up for intricate sequences of slashing enemies, projectiles, and environment items to cross long gaps or collect currency suspended over spikes. This simple moveset carries with you through the game, but your arsenal expands with access to new abilities like climbing and gliding. My favorite acquired ability is a grapple rope, which latches on to nearby enemies, walls, and hooks, opening a host of thrilling platforming opportunities. You can acquire several other upgrades by trading in time shards you collect during your travels. Time shards are obtained by exploring levels, defeating enemies, and smashing environment items. The upgrades range from invaluable abilities like being able to destroy enemy projectiles to quality-of-life luxuries like revealing the locations of hidden collectibles. Filling out the upgrade tree is rewarding and makes collecting as many time shards as possible an essential goal. 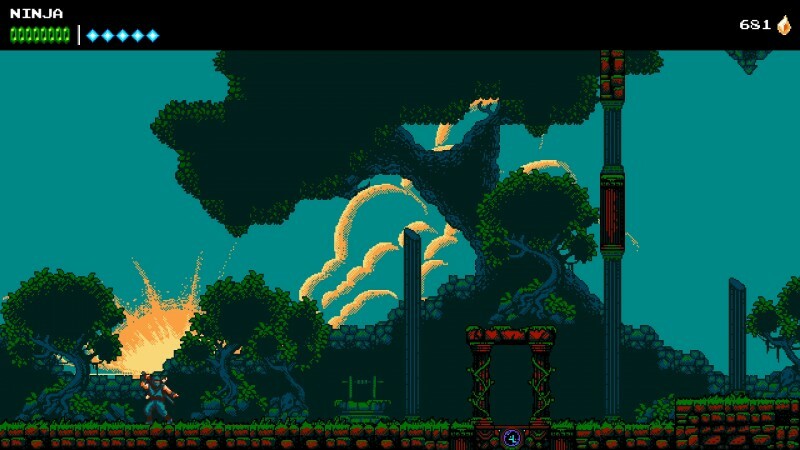 The Messenger may be a love letter to the action platformers of yesteryear, but it modernizes the formula in multiple ways. One of the biggest upgrades is foregoing the traditional extra lives and continue systems. Instead, each time you die – and you’ll likely die a good amount – a minion named Quarble resurrects you at the last checkpoint. However, he doesn’t do this out of the goodness of his heart; he follows you around for a bit after you respawn, stealing away any time shards you collect until your debt is paid. I vastly prefer this approach to respawning over the antiquating lives system, as this prevents frustration from losing too much progress while also making each death consequential. Quarble also makes amusing, fourth-wall breaking remarks upon each death. It doesn’t happen often, but the characters you interact with throughout the world often deliver humorous dialogue that pokes fun at you, as well as standard conventions of the action-platform genre. Once you progress far enough, you unlock the ability to travel forward in time thousands of years. This leap is represented by a move from 8-bit to 16-bit graphics. 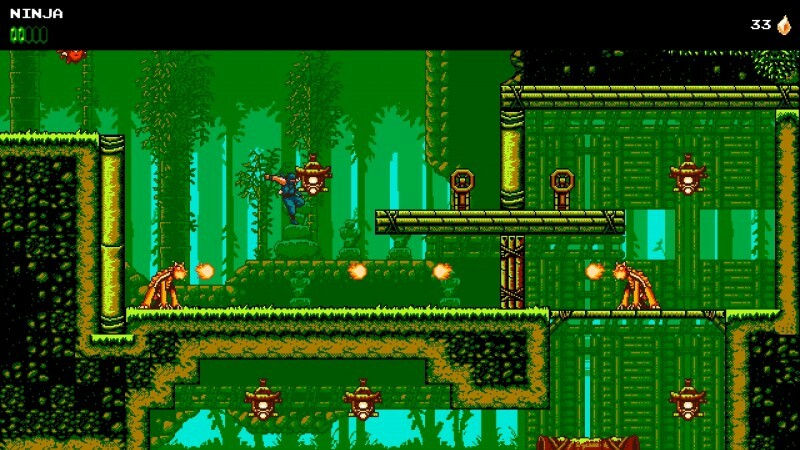 When you emerge into the future, the backgrounds are lush and immediately noticeable, and while the character sprites receive noticeable upgrades, they aren’t as jarringly different as expected. The areas are largely the same in both periods of time, but some walls and ledges are in different places, leading to exciting, yet simple puzzles as you jump between the graphical styles to coordinate to progress through a screen. Tearing through the first half of The Messenger is among my favorite experiences all year. Its curated, linear format delivers a perfectly paced adventure that had me itching to play the next stage each time I vanquished the prior level’s boss. Every time a checkpoint rewarded shuriken and health, I felt a mix of dread and excitement as I readied for the challenge ahead. 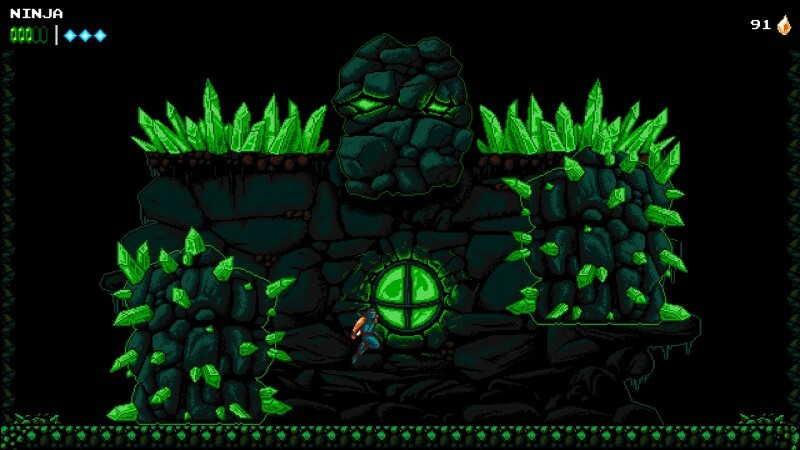 Each boss challenges you in unique ways, ranging from massive monsters with lasers and projectiles to smaller adversaries that jump around the screen and attack you up close. 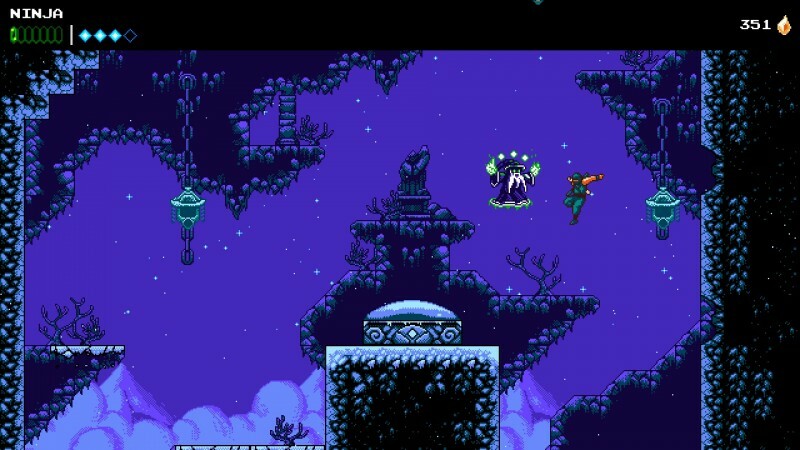 Halfway through the game, The Messenger throws a massive curveball your way in the form of a genre shift. 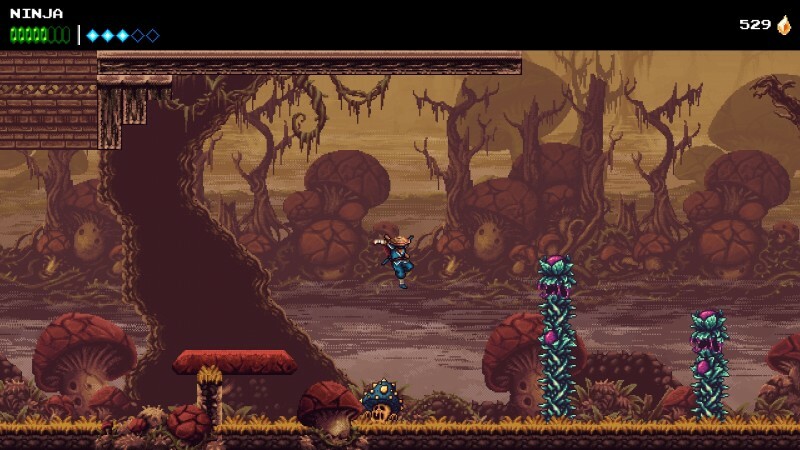 The adventure changes from a linear, stage-based experience to a Metroid-inspired game with labyrinthine areas, fast travel, and riddles hinting at where to find collectibles needed to reach the final area. I typically enjoy this brand of exploration-based platforming, but the whiplash-inducing change disrupts the pacing and swaps out a tight formula that was working well for one that, while functional, is less fun. In doing away with the linear structure, The Messenger instead relies on clues given by a character. While some hints are obvious, others had me running in circles for a while before I figured them out. You can pay a few hundred time shards to decode the riddle and place a marker on your map (I often opted for this method), but if you want to save up shards for the newly expanded upgrade tree, you have some tough decisions to make. Fortunately, by the time I found all the collectibles, I had collected enough shards to max out the skill tree before the final trek. After a hefty helping of back-tracking through areas you already played through in a better format, you finally return to a style resembling the first half of the game. 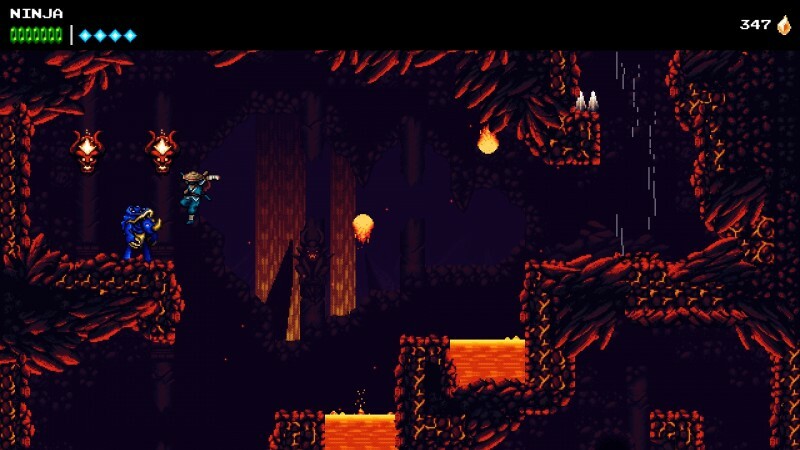 While the Metroidvania approach doesn’t play into The Messenger’s strengths as much as the linear stages, it’s far from a deal breaker. 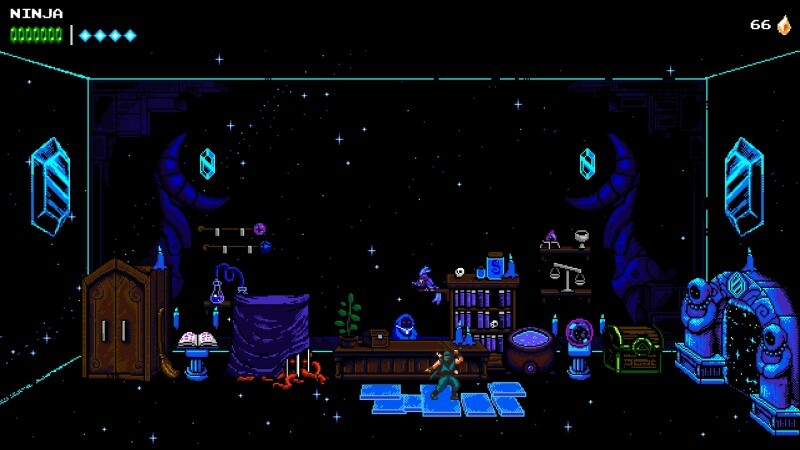 Regardless of its mid-game identity crisis, tight controls, excellent platforming, and exciting combat make The Messenger a retro journey worth embarking on. 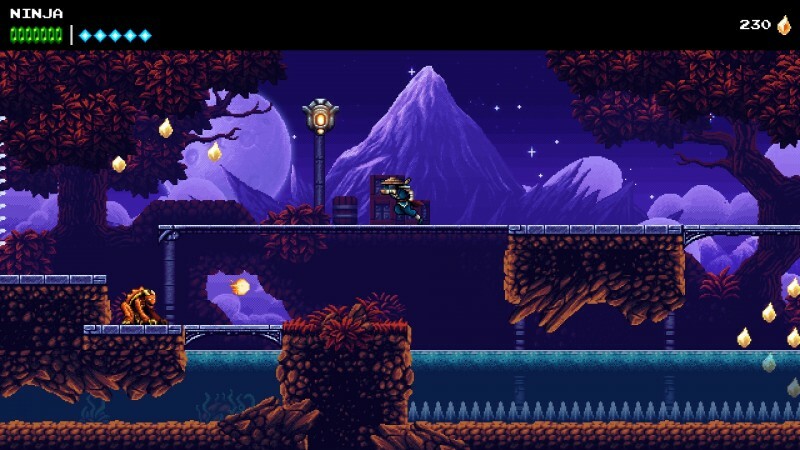 The Messenger is a strong throwback to action platformers like Ninja Gaiden with welcome twists.